3-17-23-14. While these may not be this week’s winning lottery picks, or the combination to a vault filled with precious jewels, these numbers add up to something just as valuable. They are the dates for this year’s Fix a Leak Week, which is taking place from March 17-23. The U.S. EPA and their WaterSense partners are teaming up once again to remind Americans that little leaks can add up to big, and often expensive, problems. 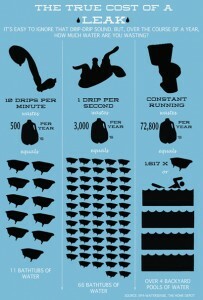 Nationwide, minor leaks contribute to 1 trillion gallons of water wasted each year. That’s trillion with a T. This is an unfathomable number to most of us, but what’s even more unfathomable is the fact that the majority of that loss is completely avoidable. 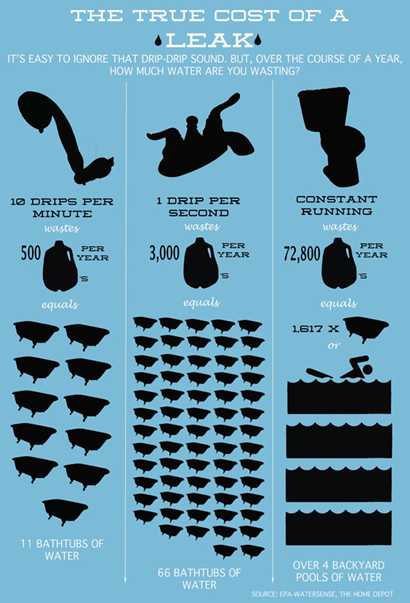 Even a leak as small as a few drops per minute can send hundreds of gallons per year down the drain. In the war against leaks, water utilities are fighting the same battles as everyone else, just on a larger scale. Professionals are working around the clock to detect leaks when they appear and to get them fixed fast. Across the country, we’re always on the job keeping track of the large and complex system, checking water mains, valves, and pipes for potential leaks or breaks by using advanced tools and technologies that encourage resource conservation and efficiency. But even with our trained technicians and specialized equipment, it’s important to remember that we’re all working toward the same goal. By caring for our water and the systems that help deliver it, both individuals and the water industry can make a difference in reducing water loss across the country.